I have been oohing and ahhhing over Pam's potato crust quiches and pies for some time now. What a great concept. What was I waiting for? It's a nice change from pie crust or pate brisee, and certainly easier. This recipe was a happy accident. I had leftover sausage with mushrooms and onions from dinner the night before and needed to use them in something. 4 little Yukon Golds on the counter, not enough for 2 portions for dinner, so the pie crust it was going to be. I used a mandolin and sliced the potatoes (w/ the skins on) into super thin slices. (Pam recommends using 1 1/2 russet potatoes). 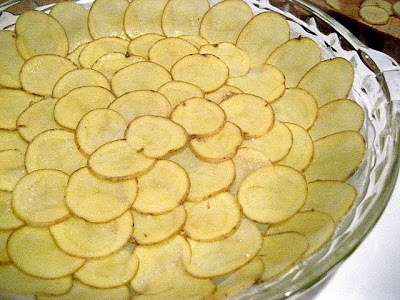 Butter or oil a 9" Pyrex glass pie dish and overlap the potato slices decoratively to make a fan design. This will be your crust. (Pam pre-cooks the potatoes for 7 minutes in the oven after she lines the pie dish, but since my potato slices were so thin, they didn't need any pre-baking, they cooked beautifully with the rest of the pie). 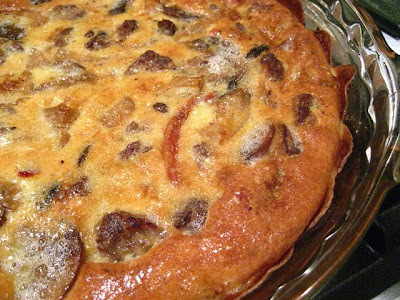 You can cook the sausage, onion and mushrooms all in the same skillet. They will be done about the same time. Cook in olive oil until mushrooms are browning and sausage is cooked thru. Let mixture cool. Mix eggs with cheese and add the sausage mixture to the custard. Pour into prepared potato crust and bake at 375F for 25-30 minutes. This was so delicious, I've made it 3 times already for Sunday breakfast! 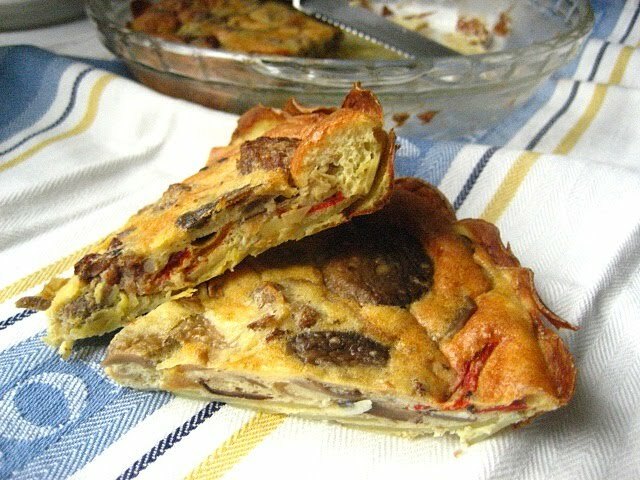 It tastes a lot like a Spanish tortilla, but without all the oil. I'm not a big fan of pie crust. So this might just be the right crust for me! Spanish tortilla without the oil! Oh yeah bring it on! Mmmm...this sounds wonderful. A great way to use up the few remaining potatoes! Happy accidents are the best! Your sausage pie is to die for! This will put the zip back in my step anytime! Love this idea Stacey - those potato slices look so pretty and it seems so much easier than making a crust. I love everything about this - brilliant! Yours looks beautiful and delicious. I am so glad you tried it... I almost made one for dinner tonight. Thanks for the shout out and link back to my site. 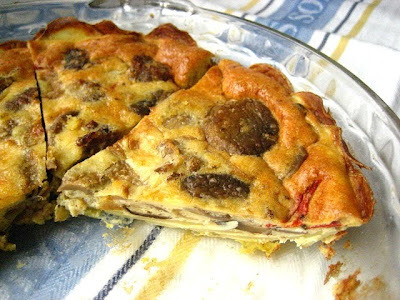 Thanks for this great recipe for sausage and mushroom pie with a potato crust. I think most people would agree the crust is what makes this dish. Great idea with the potato crust, I can't wait to try it!